We always have a selection of breeding females for sale, both white and coloured. Prices vary depending on age and genetic background so there is bound to be something to suit your budget. Below are just a few of the females that are currently available. If you don't see what you are looking for, call us to find out what other females are available. Discounted stud fees are available for anyone purchasing males or females from us. Some females are kept empty to allow you to select your preferred herdsire. This is the first of our coloured suri from a Surilana Mister B mating to be released for sale. She is quite simply - SUPERB. Her fleece is an even colour over her whole body and at just 4 weeks old she was showing wonderful lock structure and amazing lustre. Her Grand Dam is a solid "true" black suri so there is a good chance of Biscuit throwing black cria. 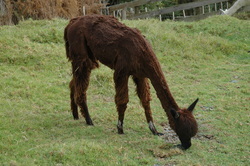 Her dam is a lovely rich "red" brown suri who has won ribbons in the show ring. Hini has only been entered into two shows so far and was awarded 1st place in her class at both Kumeu and the Royal Easter Show at Auckland. At Auckland she went on to win Reserve Champion Junior Female. Waiaro (Maori for Attitide for which she has plenty) is another beautiful coloured suri out of Mister B. Her dam is a true "blue" black and at 8 years of age was still only 25 micron. This lovely female has the potential to throw true blue blacks with very fine fleeces if put to a good black suri male. She has fabulous lustre which is not surprising as both her dam and sire have wonderful lustre. Waiaro was awarded 4th place in the most promising suri cria at Kumeu show and 1st in her class at Auckland Royal Easter Show. Aroha has an incredibly soft fine fleece which she has inherited from her sire Hadstock NZ Silken Monaco ET. She has white "socks" on her front feet but the rest of her fleece is a beautiful even solid brown. Aroha has won a ribbon in every show she has entered, including Champion Brown. Aroha was mated to Surilana Moss on the Rocks ET on 7/4/2013. There are more photos of Aroha here. Cloud has produced an exceptional young male from a mating to Surilana Mister B. Her dam (Alpaca Xperience Dreamer who is also for sale) has produced multiple champions and we would hope that Cloud will do the same. Cloud's fleece is really soft and lustrous and has won many show ribbons. Cloud was mated to Surilana Mister B ET on 14/1/2013. 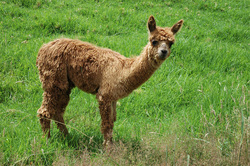 This is an excellent opportunity for new alpaca breeders. Dreamer is an older girl who has produced multiple champions. She still has many years of breeding to go and will no doubt produce some more champions when bred to a good male. She is a great mother, giving birth easily and always looking after her cria. Dreamer had a gorgeous female cria from Surilana Mister B in 2010 and a lovely dark fawn cria in March 2011 from Kandiah Jumping Jack. Ana has a wonderful temperament as well as a lovely fleece. Her sire won Supreme Champion at the Australian National Show and her dam has produced multiple ribbon winners (including multiple Supreme Champions). Ana comes with a free on farm mating to one of our herdsires.